In accordance with Council Decision (EU) 2017/1567 (1), the Protocol to the Partnership and Cooperation Agreement establishing a partnership between the European Communities and their Member States, of the one part, and the Republic of Uzbekistan, of the other part, to take account of the accession of the Republic of Croatia to the European Union (‘the Protocol’) was signed on 17 July 2017, subject to its conclusion at a later date. As regards matters falling within the competence of the European Atomic Energy Community, the conclusion of the Protocol is subject to a separate procedure. The Protocol to the Partnership and Cooperation Agreement establishing a partnership between the European Communities and their Member States, of the one part, and the Republic of Uzbekistan, of the other part, to take account of the accession of the Republic of Croatia to the European Union (2), is hereby approved on behalf of the Union and of the Member States. The President of the Council shall, on behalf of the Union and the Member States, give the notification provided for in Article 4(1) of the Protocol (3). Done at Luxembourg, 21 June 2018. (1) Council Decision (EU) 2017/1567 of 8 June 2017 on the signing, on behalf of the Union and of the Member States, and provisional application of the Protocol to the Partnership and Cooperation Agreement establishing a partnership between the European Communities and their Member States, of the one part, and the Republic of Uzbekistan, of the other part, to take account of the accession of the Republic of Croatia to the European Union (OJ L 238, 16.9.2017, p. 1). (2) The text of the Protocol has been published in OJ L 238 of 16.9.2017 together with the decision on signing. (3) The date of entry into force of the Protocol will be published in the Official Journal of the European Union by the General Secretariat of the Council. In accordance with Council Decision 2002/917/EC (1), the Agreement on the international occasional carriage of passengers by coach and bus (Interbus Agreement) (2) was concluded, on behalf of the Union, on 3 October 2002 and entered into force on 1 January 2003 (3). On 5 December 2014, the Council authorised the Commission to open negotiations for a Protocol to the Interbus Agreement (the ‘Protocol’) with the Republic of Albania, Bosnia and Herzegovina, the former Yugoslav Republic of Macedonia, Republic of Moldova, Montenegro, Republic of Turkey and Ukraine. The negotiations were successfully concluded during the meeting of the Contracting Parties to the Interbus Agreement on 10 November 2017. The Protocol should facilitate the provision of regular and special regular services between the Contracting Parties to the Interbus Agreement and hence give rise to improved passenger transport links between them. As regards general rules, notably the operation of the Joint Committee, and in order to facilitate its application, the draft Protocol largely mirrors the rules established in the Interbus Agreement. In order for its benefits not to be excessively delayed and similarly to what the Interbus Agreement stipulates, the Protocol provides for its entry into force, for the Contracting Parties that have approved or ratified it, when four Contracting Parties, including the Union, have approved or ratified it. The signing of the Protocol to the Agreement on the international occasional carriage of passengers by coach and bus (Interbus Agreement) regarding the international regular and special regular carriage of passengers by coach and bus is hereby approved on behalf of the Union, subject to its conclusion (4). (1) Council Decision 2002/917/EC of 3 October 2002 on the conclusion of the Interbus Agreement on the international occasional carriage of passengers by coach and bus (OJ L 321, 26.11.2002, p. 11). (3) OJ L 321, 26.11.2002, p. 44. (4) The text of the Protocol will be published together with the decision on its conclusion. By its Decision No 291/10/COL of 7 July 2010, the Authority recognised the entire coastline of Norway as a disease-free zone with regard to both Marteilia refringens and Bonamia ostreae, with the exception of the county of Aust-Agder in Southern Norway in relation to Bonamia ostreae. On 23 February 2017, the Norwegian Food Safety Authority notified through the Early Warning System of OIE (The World Organisation for Animal Health) (2) a suspicion of an infection with Marteilia refringens of blue mussels (Mytilus edulis) found growing wild in a flat oyster (Ostrea edulis) aquaculture farm in the location of Bømlo municipality in the County of Hordaland in southern Norway. By an email dated 28 February 2017 (Doc No 844246), the Norwegian Food Safety Authority informed the Authority of the same suspicion and that restrictions on movement of blue mussels or flat oysters out of or into the aquaculture farm had been imposed. The Norwegian Food Safety Authority informed the Authority by email dated 16 March 2017 (Doc No 847935), following notification through the European Animal Disease Notification System (ADNS) on the same day, that the European Union Reference Laboratory for Mollusc Diseases had confirmed the disease and that a containment area would be established around the aquaculture farm. Article 53(3) of Directive 2006/88/EC provides that where an epizootic investigation confirms a significant likelihood that infection has occurred, the disease-free status of the relevant Member State, zone or compartment shall be withdrawn, in accordance with the procedure under which that status was declared. The Norwegian Ministry of Trade, Industry and Fisheries wrote to the Authority on 28 September (Doc No 875660) enclosing a notification letter of the Norwegian Food Safety Authority dated 22 September 2017 (Doc No 875658) stating that a regulation establishing a containment area for Marteilia refringens in the municipality of Bømlo in Norway (3) had now been adopted and confirming that, in accordance with the relevant national legislation (4), ‘the whole of Norway's coastal area is in category I for Marteilia refringens, with the exception of the containment area in the municipality of Bømlo in Norway’. 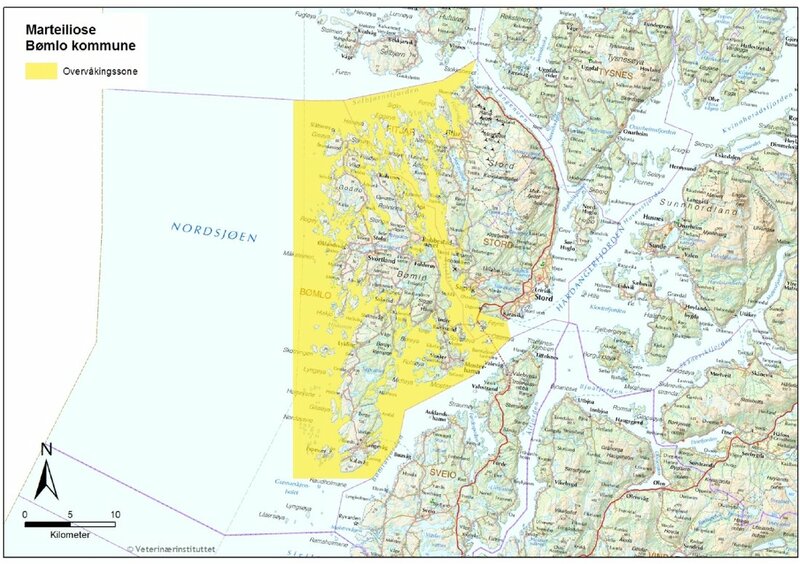 The Authority considers that the conditions of the provision for withdrawing the disease- free status of the affected geographical area of Bømlo municipality in Norway are fulfilled. Accordingly, and in the interest of simplification, Decision No 291/10/COL of 7 July 2010 should be repealed and replaced by a new decision. The disease-free status of Norway regarding Marteilia refringens and Bonamia ostreae is described in the Annex. Decision No 291/10/COL is hereby repealed. This Decision shall enter into force on 8 February 2018. This Decision is addressed to Norway. Only the English text version of this Decision is authentic. Done at Brussels, 9 February 2018. (2) NOR 24-02-17 OIE Alert. (3) Forskrift om kontrollområde for å bekjempe sykdommen Marteiliose hos bløtdyr, Bømlo kommune, Hordaland, FOR-2017-09-08-1377 (Regulations on control area to fight the disease Marteiliose in molluscs, Bømlo municipality, Hordaland). (4) Forskrift om omsetning av akvakulturdyr og produkter av akvakulturdyr, forebygging og bekjempelse av smittsomme sykdommer hos akvatiske dyr, FOR-2008-06-17-819 (Regulations on the sale of aquaculture animals and products of aquaculture animals, prevention and control of infectious diseases in aquatic animals). a point (59° 58,917′ N; 5° 19,114′ E) in the northern tip of Stord. The map of the control area attached to the Regulation is reproduced in the Appendix to this Decision. the county of Aust-Agder in southern Norway.